Daphne is a task manager replacement with a variety of extra features. It displays a list of currently running process with detailed information about: CPU usage, Process ID, Process name, Full path (and arguments), Priority, Class (Process / Service), Current memory usage, Peek memory usage, Current swap usage, Peek swap usage and Number of threads. Additionally, the program has a crosshair that can be dragged onto existing windows to Find, Kill, put on top, change transparrency, and even enable/disable. A "trap" feature lets you modify or prioritize processes whenever they appear. Windows Explorer integration bug fixed. I had no problems using LessMSI 1.1.3 on the x64 installer. Daphne v1.55 64-bit is portable. 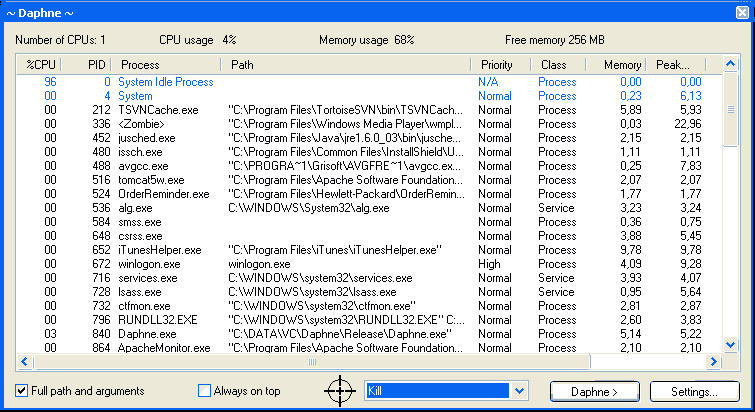 My task manager of choice for corralling processes and killing processes that need to go, but takes up a lot of processor power to run on my Win7x64 system. As a result, despite some of the cool monitoring tools included, I generally run it to do something and then immediately close. Also, as many have pointed out, this program really needs a manual. Yes, Midas is correct... Less MSI(rables) or install, copy, uninstall. I will edit the entry later. Baas: don't have a way to test the msi system ... could you create a forum post and i'll link to it? Admin notice added. LANG folder is optional. Also, requires admin privileges to run. The "How to extract" instruction does not work for the 64-bit msi installer.